John Boyega, who played Finn in “The Force Awakens” and “The Last Jedi,” took to Twitter on Tuesday to call out “Star Wars” fans for harassment. The toxicity of the “Star Wars” fandom has reached new heights recently, and actor John Boyega, who plays Finn in the new trilogy of films, is sick of it. 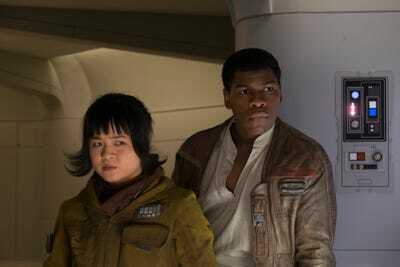 Boyega took to Twitter on Tuesday to call out fans for harassment in the wake of his co-star Kelly Marie Tran (Rose Tico in “The Last Jedi”) deleting all of her Instagram photos. Tran had faced months of racist and sexist harassment online after being cast in “The Last Jedi.” Her character’s Wookieepedia page was even edited so her name was “Ching Chong Wing Tong” and her home was “Ching Chong China.” She’s not the only “Star Wars” actress to distance herself from social media after harassment: Daisy Ridley deleted her Instagram account in 2016. Lol yes because I was dying to receive that 100M in my account ???? I hear you though.. we experience the exact same thing and I’ll see the world through your perspective. Just email me you’re reactions to scenarios and I’ll be sure to react just like you! Our issues are identical! Yes because i always was. Got a million from the government for being born and a silver spoon. Lol you have noooo idea mate ???????? none. Yes because money buys unlimited access to only one emotion…. gratitude. You’ll only know when you’re in that position. Funny enough I’ve experienced two extremes. Trust me. It doesn’t work that way. I take it you have no clue as to what my experience has been throughout this. So won’t hold it against you. “You understand that there is a process so much appreciated!” he tweeted. Boyega isn’t the only “Star Wars” major player to address the harassment.